With Lily exposed to the vampire virus and lying in a coma, it’s up to Mel and Carter to search for the cure. Time is not on their side. With every passing heartbeat, Mel is becoming more and more purely vampire. Desperate, Carter and Mel decide to split up. Carter will recruit human rebels from the Farm in San Angelo to infiltrate the guarded kingdom of the vampire Sabrina and steal the cure. 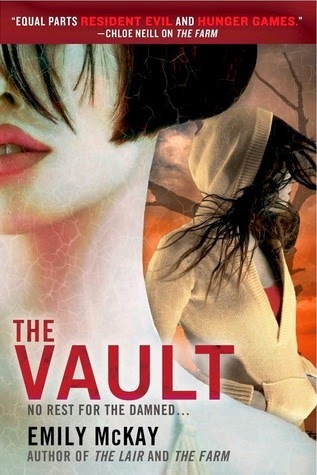 Mel will go back to her mentor, her friend, her betrayer, Sebastian, who is the only one who can access an underground vault that may house the secret to the cure. That is, if he’s still alive after she staked him to the ground. Now her worst enemy may be their best hope for curing Lily—and saving the human race. An amazing series ender, I was on the edge of my seat the entire time. The POV switches between Lily, Mel, and Carter. Lily is becoming a Tick while Carter and Mel are searching for the cure. There's non-stop action and I literally couldn't stop reading because I had to know what happened to the characters. It's intense! Interesting twists, including a new romance for Mel, who is struggling with being a vampire, especially since that means she's not autistic anymore. There are some heartbreaking moments for Mel and Sebastian and I appreciated the complexity of their relationship. Carter and Lily's love for each other…it's EPIC. (By the way, there are no love triangles in this series. At all). My one complaint is that there should have been an epilogue. The story wraps up, but I would have loved to see how it all played out. Additionally, there are two characters who disappear and we never find out whether they live or die. If you think there's nothing new to read about vampires, read The Farm series. I highly recommend it! I'll definitely have to check this series out! Great review, Pam! This is new to me and it sounds really interesting. I have to check this out! I haven't started this series but I am glad to see it concluded well. That is always motivation of me to pick up a new series!